ZONG, the first international brand of China Mobile, Alcatel-Lucent and Research In Motion (RIM) today announced the launch of the BlackBerry® solution in Pakistan. Using BlackBerry® smartphones, ZONG customers will be able to wirelessly send and receive emails, make phone calls, browse the Internet, send text messages and access a wide range of corporate and lifestyle applications while on the move. Initially, ZONG is offering the BlackBerry® Curve™ 8900 and BlackBerry® Bold™ smartphones and a choice of BlackBerry® Internet Service or BlackBerry® Enterprise Server. The BlackBerry solution will be available immediately with ZONG’s postpaid packages, providing a range of monthly packages tailored to meet customers’ needs. Under the terms of a distribution agreement with RIM, Alcatel-Lucent will leverage its global integration services and strong local presence in the region to provide ZONG with end-to-end implementation, launch, delivery and support services for the BlackBerry solution in the Pakistani market. Alcatel-Lucent’s experience in managing the delivery, technology integration and deployment of the BlackBerry solution will enable ZONG to focus on providing the requisite customer services to match anticipated market demand. “We are pleased to work with Alcatel-Lucent and Zong to deploy the BlackBerry solution in Pakistan. The BlackBerry solution continues to lead the industry in providing an optimized and empowering mobile experience for organizations and individuals who want to make the most of their time,” said Mark Guibert, Vice President of Corporate Marketing, RIM. 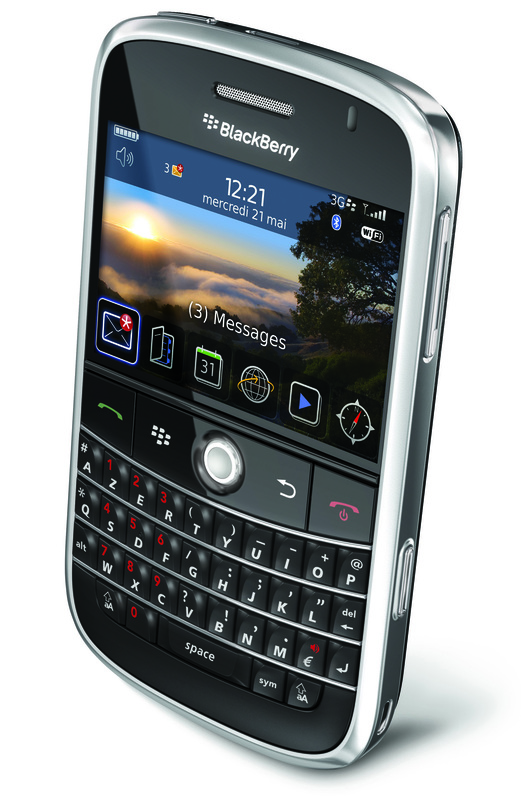 The BlackBerry Curve is a sleek full-QWERTY smartphone that feels comfortable for either one-handed or two-handed use. Its large, striking 2.4 inch HVGA+ display (480×360 pixels) projects vivid color and makes information easy to read. The BlackBerry Curve 8900 provides global connectivity support and helps people stay connected and find their way with built-in Wi-Fi® (802.11 b/g) and GPS. The BlackBerry Bold smartphone is a communications and multimedia powerhouse. It supports tri-band HSDPA high-speed networks around the world and comes with integrated GPS and Wi-Fi (802.11 a/b/g). It also features a rich set of multimedia capabilities, including a 2 megapixel camera with video recording and an advanced media player for music, videos and pictures. ZONG is offering BlackBerry® Enterprise Server for corporate clients, a solution that tightly integrates with IBM Lotus® Domino®, Microsoft® Exchange and Novell® GroupWise® and works with existing enterprise systems to enable secure, push-based wireless access to email and other corporate data. For individuals and smaller businesses, BlackBerry® Internet Service enables users to manage up to ten supported email accounts, including most popular ISP email accounts, from a BlackBerry smartphone. is that blackberry locked to work with zong sim only ? Will these sets be locked? What would be their Price and Tariff? they shud be and the simple reason is, for blackberry handheld pin plays the vital role. PIN got registered on network for its user to avail BlackBerry services, GPRS, MMS etc otherwise its simply a handset…. batter to confirm the same from Zong help line. what about the tariff, pro pakistani shud compare all mobile campanies tariff for Blackberry, that might be easy for new user to select the best one along with EDGE or GPRS network info, if there any?????? What most important was the package details……..
How is Zong service in general in Pakistan. Specially karachi. Is it worth going monthly with Zong? How much the phone cost in Pakistan? i dont really know about the service in general but i have personally used the internet services of zong telecom the witch i think is one of the best right now. for latest new updates reviews prices specs and features you can visit this link you will get what you want and much more. whats the monthly installment plane?? does anyone know?? u will face a lot of problems in karachi due to week Zong signals. i have used ZONG unlimited GPRS but it was realy pathetic due to low speed. Try this deal, finally u will have to switch to some other good service provider and u would feel the difference.. Zong is running only on adds not on service…. I bought Zong Black berry connection just three days back with new postpaid connection from Zong service center Quetta. The sales rep guided me abt the features and ensured me abt the best quality service. On very first day within two hours my connection got blocked. I visited zong office very next day and was informed tht I am being charged for GPRS thats why my connection got blocked. I was ensured tht my amount will be adjusted to restore my number I must clear my bill amount, so I ended-up paying Rs. 1500 connection charges and then Rs. 1200 billing overall 2700 and today again my connection is blocked a service tht does’nt cost u more then Rs.1000 plus tax. I went office to return the same but sales rep assured me tht my problem will be fixed today but my number is still blocked. So I am paying for a service which cannot be used at all. Three days line rent that has been charged will go down the drain…I m thinking of closing this connection by tommorow if my problem was’nt resolved. So far my experience has been a really bad one. Any info about pricing and monthly installments ??? classic mobile yaaaar . i have it and fully satisfied with it. The ppl at zong are very good at new ideas, so expect such things from them. I need help to use black berry please can any body let me know how to copy contact and massages from memory card int o black berry memory and after copying some numbers when i got some calls from my friends there number is showing there but name for identiofication is not coming. I hared that used one is really cheap in price and i love to have if some is willing to sell his/her BB. But one this i want to ask that is it block to zong network or i can use this with any other netowrk? I own Zong connection. Well Zong provides good value added services to its customers across Pakistan, like these blackberry solutions but i want to add one more thing Zong really need to review their service in terms of coverage. u will face a lot of problems in karachi due to anniversary Zong signals. i accept acclimated ZONG absolute GPRS but it was realy affecting due to low speed. Try this deal, assuredly u will accept to about-face to some added acceptable account provider and u would feel the difference.. Zong is active alone on adds not on service….